We are again honored to welcome the John J. Harvey Fireboat back to Oyster Bay. Fireboat John J. Harvey, launched in 1931, served the City of New York and New York Harbor until she retired in 1994. She was a historic first; the first fireboat powered by internal combustion engines, the first that could pump and maneuver simultaneously, and was the largest, fastest fire fighting machine of her time, capable of pumping 18,000 gallons per minute. John J. Harvey was named for FDNY pilot John J. Harvey who was killed aboard fireboat Thomas Willett while fighting a fire aboard the North German Lloyd Line's SS Muenchen. Harvey assisted during such notable fires as the Cunard Line pier fire in 1932, the burning of Normandie in 1942, and the ammunition ship El Estero during World War II. She served the FDNY until her retirement in 1994. On September 11, 2001, John J. Harvey was recalled to service by the FDNY and reactivated as Marine Company 2. Alongside the FDNY fireboats, Fire Fighter and John D. McKean, she pumped water for 80 hours until water mains in lower Manhattan were restored to service. Harvey's action that week was the subject of countless news articles and a 2002 Maira Kalman book. The National Trust for Historic Preservation gave the Harvey a special National Preservation Award to recognize this incident. This summer, multidisciplinary artist Tauba Auerbach, evoking the DAZZLE camouflage patterns painted on WWI and WWII vessels to confuse enemy U-boats, has unveiled New York's own 21st-century dazzle ship; John J. Harvey. Co-commissioned by the Public Art Fund and 14-18 NOW with support from the crew and volunteers of John J Harvey, this magnificent work will be available for public viewing at the Oyster Festival. We are proud to support this historic vessel. Also present will be Christeen, a 40-foot, gaff-rigged sloop, owned and operated by The WaterFront Center, a not-for-profit community sailing and marine education center located in Theodore Roosevelt Park. Christeen connects people to the water through education and recreation, taking out more than 3,000 passengers each year. The oldest surviving oyster sloop in America and a National Historic Landmark, Christeen was originally built in 1883 for Captain William Smith in Glenwood Landing for harvesting oysters in Oyster Bay and Cold Spring Harbor. For more than 125 years, she has served as an oyster dredge and also as a cargo carrier and live aboard between Connecticut, New York and New Jersey. After surviving 16 major hurricanes, numerous Nor’easters, two sinkings and severe neglect, Christeen was returned home to Oyster Bay in 1992. 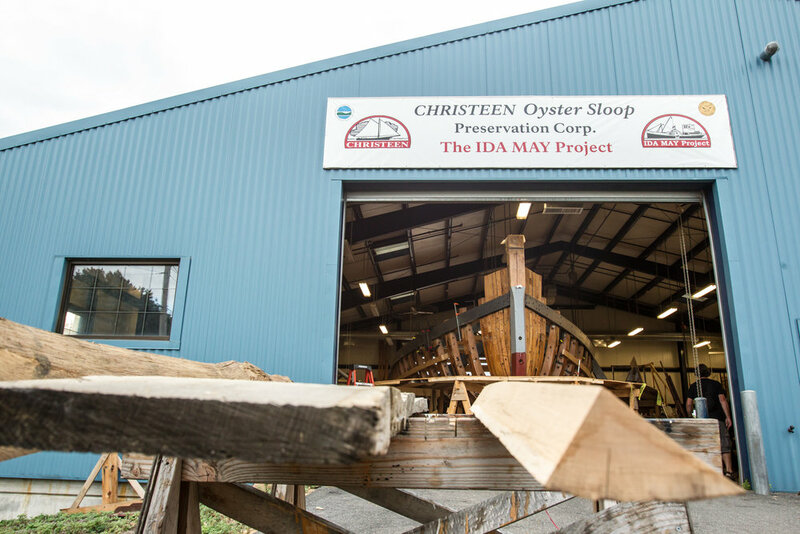 Volunteers worked with a full-time shipwright and raised more than $300,000 to completely restore and launch Christeen in 1999. Observe West Harbor and Oyster Bay from a different viewpoint as you cut through the water under sail and look towards the shore. See wildlife, important landmarks, and learn about some of the history of the home of a former President. 1-2:30 p.m. & 3-4:30 p.m.